Sydney: Australia blew a strong start with yet another top order batting collapse in Sydney Saturday, leaving themselves a mountain to climb to stay in the fourth and final Test against India. When play was abandoned half an hour early due to rain, they were 236 for six, still 386 behind with Peter Handscomb (28) and Pat Cummins (25) fighting a rearguard action after some soft dismissals plunged the hosts into deep trouble. "I got a start and a few of us got a start but none of us went on to get a big score so it´s pretty simple to work out what went wrong," said Harris. "We´re a young group and we´re trying to work it out and think on our feet but we´re playing against the number one side in the world, so it´s not like it´s an easy thing to do." Despite the task ahead, Harris remained optimistic. "Obviously 600 is a big score to chase down or get a close deficit, but I think the more time we can occupy the crease, you never know what can happen." 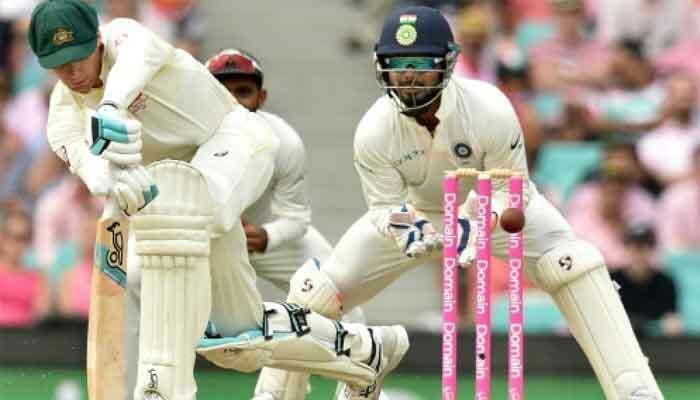 India took a stranglehold on the match over the opening two days, compiling a huge 622 for seven declared on the back of centuries from irrepressible Cheteshwar Pujara and livewire Rishabh Pant. Yadav said India´s fielding and catching practice was paying off. "I feel like we are the best side in the world now when it comes to fielding," he said. Skipper Virat Kohli´s declaration left Khawaja and Harris to face 10 nervous overs before stumps on Friday, when they crawled to 24 without loss. Khawaja was dropped on nought but failed to make the most of his second life. On a day when the Sydney Cricket Ground was a sea of pink to mark a breast cancer awareness initiative, he was dismissed for 27 after mistiming a shot off Yadav with Pujara taking an easy catch. At the other end the diminutive Harris, who has shown flashes of brilliance in his short four-Test career, quickly found a groove with some crisp shots. He survived a close call on 24 when a diving KL Rahul narrowly missed a catch and reached his second Test 50 with a single before smacking three fours in one Yadav over. Harris went to lunch on 77 but added just two more before chopping a Jadeja delivery onto his stumps, blowing a glorious chance to press on and make Australia´s first century of the series. So far, none of Australia´s batsmen has reached three figures over the four Tests, with Harris´ 79 the highest anyone has scored. In contrast, India have had a field day, compiling five centuries. But he was sent packing by a blinding reflex catch from Ajinkya Rahane at mid-wicket off Mohammed Shami´s bowling. Marsh scored a century in Sydney against England this time last year, but was out for eight, tickling an edge to Rahane at slip from a turning Jadeja ball. The day got worse when Travis Head was caught and bowled by Yadav just before tea for 20 and as storm clouds gathered overhead Yadav clean bowled Paine for five.